3 ANATOMY OF AN OIL FILTER – HOW THEY WORK? 6 Why Should You Change Oil Filter for Your Car? 7 How Will Oil Filters Help Us? Oil in your vehicle’s engine can often be compared to blood in your body. Just like you stand a good chance of dying if the blood in your body gets tainted, so too will your engine stand a good chance of quitting on you if its critical oil gets contaminated. That is why the oil filter in your car plays such a crucial role in keeping your vehicle’s engine running for a long time. 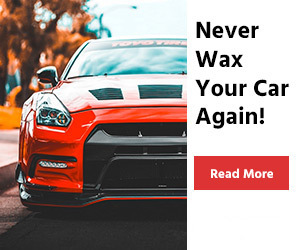 It will filter out the impurities that get in your oil as your engine works and keep these impurities from building up in places where they can cause damage to your engine. It is not a job you want to entrust to just any type of oil filter and you want to make sure you get the best oil filter you can for your vehicle. 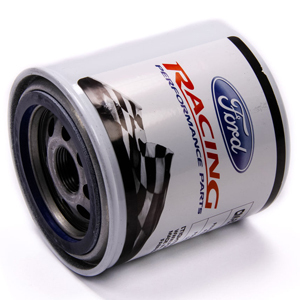 If you own a Ford Mustang or any other car with a high-performance engine then we don’t see why you would ever take a chance and put any other oil filter besides this one on it. This is an outstanding oil filter that will keep your cars all-important oil free of dirt and other contaminants as it circulates throughout your engine. We like this filter’s size a lot. It is a much bigger filter than the original equipment filters that come with many of the Ford vehicles you can use this product. Bigger filters mean more filtering space and a little bit more time between oil changes. This is a really great filter but it is also on the expensive side as far as oil filters go. If you don’t have a high-performance vehicle, then you may not want to spend this much money when another filter will do the job adequately. 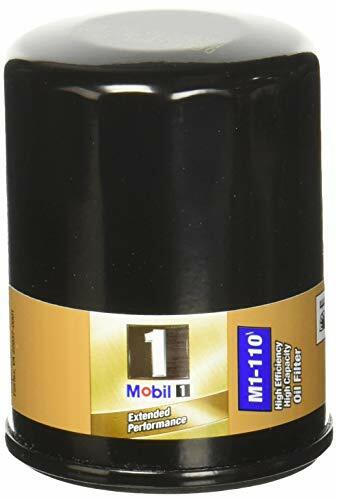 Without a doubt, Mobil 1 oil products have proven to be top performers in the automotive industry and this great oil filter from them is no exception. You have to be careful choosing which oil filter to put on your car these days because vehicles are being made to go longer intervals between oil changes; this filter can handle that no problem. There are two things this oil filter has that get us excited. One is the fact that it uses synthetic blend fibers to provide the screens in it that take contaminants out of the oil that passes through it. Its larger size also allows it to be able to filter out a whopping 28 grams of contaminants before it needs replacing. We have learned that with some model vehicles this filter will trigger the check engine oil light to come on falsely. There are very few companies that make oil filtration products that do it as well as Royal Purple does. This filter only confirms that statement because it is a very good product. It will filter out even the tiniest of particles thanks to its advanced synthetic fiber filtration media. This filter is a beast. It is not heavy but it is just really sturdy. Most filters will have areas on them you can almost collapse if you press them too hard. This filter has no weak spots at all which helps it hold up very well if you are trying to install it in a hard to reach the area. 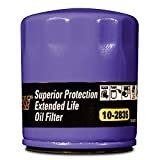 These are great oil filters no doubt but we are a little wary about the claim it will last 12,000 miles before it needs replacing. This is a company that is known for making high-quality auto parts at an affordable price and that is exactly what you get with this oil filter from the. It screens even the smallest of particles from your engine oil as it passes through it and this filter features the same excellent technology as many other oil filters twice its price. One of the biggest problems with oil filters is they tend to leak around the seal after prolonged use. 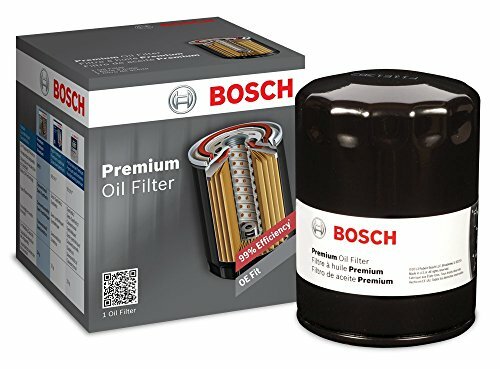 This oil filter from Bosch allows for more lubricant to be collected around the seal so it makes a tighter and longer lasting seal. 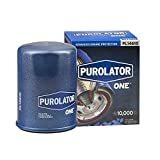 We noticed that the canister itself on this oil filter is not as sturdy as we have seen on some of the others on our reviews but that is not a deal breaker for the lower price you pay for it. If you own a vehicle that is a GM product then replacing your existing filter with this one is never a bad idea. It is a higher quality filter than the OEM filter that came with your vehicle. 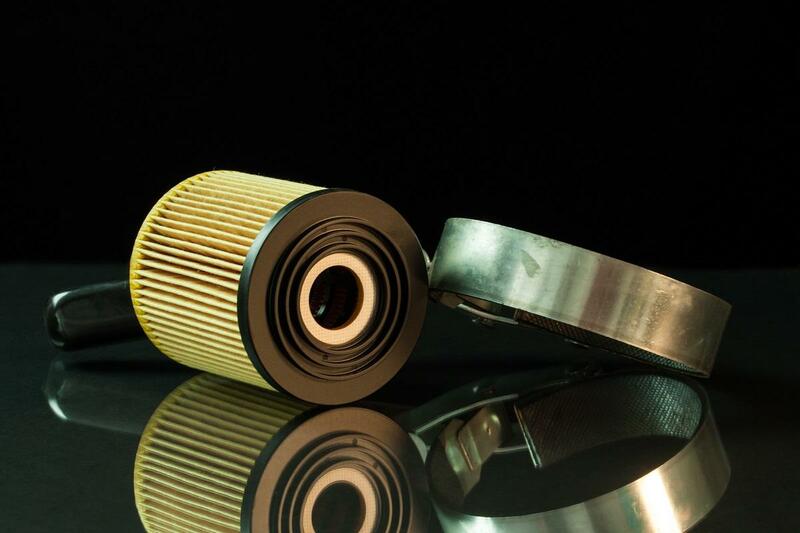 This filter is 98% efficient at filtering contaminants that are as small as 25 microns out of the oil in your engine. We really liked the way they designed the seal on this model oil filter. It is a heat seal, so once you screw your new filter on tight and the engine heats up you should never have to worry about a leak on this filter. This filter is a little bit bulky in nature. That makes it a little tougher to get on your engine than some of the other filters that we tested. 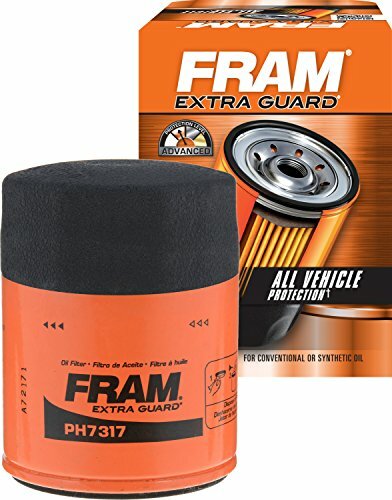 There are some pretty reputable auto parts manufacturers that have placed replacement oil filters on our list and Fram is certainly one of them. This is a very high-quality filter that does a great job at keeping your critical engine oil free of dirt and debris. Well for sure we all loved the price that this filter was sold at. We also liked the fact was not too much filter for normal production cars like some of the products on our review list certainly are. We have two concerns about this Fram oil filter. It is not designed to be on your vehicle for over 5000 miles and it is not made for use with synthetic blend motor oils. 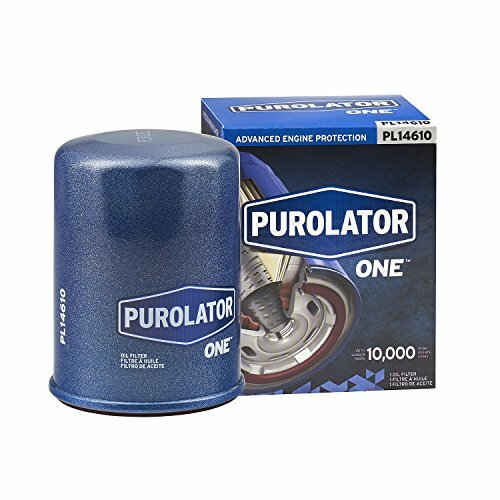 If you want to get rid of up to 99% of the contaminants that often plague engine oil, then this fine oil filter from Purolator will work for you nicely. It is a sturdy filter so you will have no problems installing it’s made in sizes that will fit a wide variety of domestic and imported vehicles. This oil filter does an excellent job for the price you pay for it. It can even be used in conjunction with synthetic and longer-term oils which is rare for an oil filter in this price range. Check your filter closely before installing it. On more than one filter we found small specks of the outside coating near the filter opening when we took them out of the package. 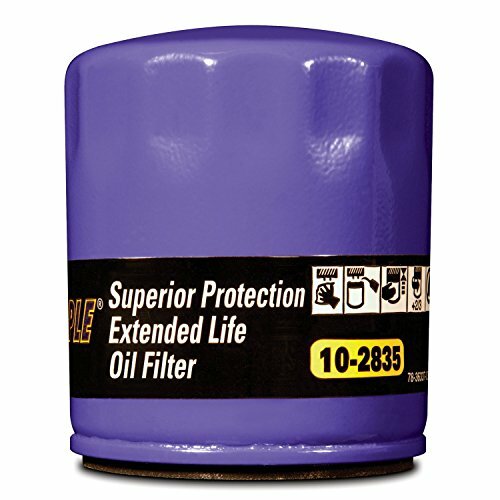 This company has been making quality filters for a long time and this oil filter is no exception. It filters even the smallest troublesome particles out of your engine oil as it passes through it. It is made of high-grade pleated paper filter material and is also built very sturdy so it will not warp when you go to install it. 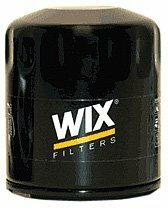 This is a high capacity filter that Wix makes here. That means if you combine it with high-quality oil it holds more impurities so you can go longer in between oil changes. We liked this filter but we have, to be honest that we feel it might be priced a little high. You can probably find similar quality filters at a lower price if you take the time to shop around. Just because you own a diesel powered vehicle does not mean that you can’t have a great oil filter working in it. 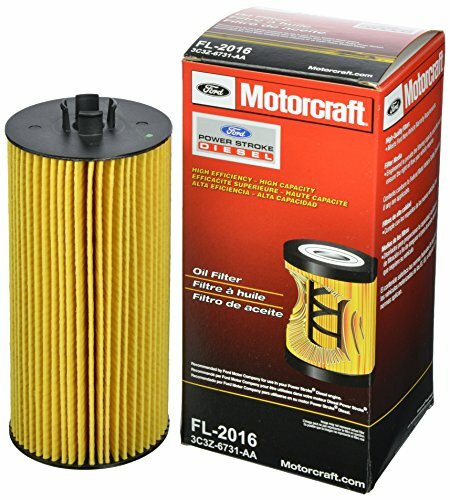 That is what you get from this great Ford Motorcraft replacement filter. It works exceptionally well on many Diesel engines that Ford makes and some others too. It is a higher quality filter than what came with your Ford truck when you first purchased it. There is a lot to like about this oil filter from Motorcraft. For one it has a built-in pressure relief valve that will help keep your oil flowing smoothly through your engine even when it’s cold out. We also like the fact that it is backed by a 12-month guarantee. This filter is definitely on the pricey side but we do not feel that is a real deal breaker with this part because it is made so well. These Mann Filters are specifically made for many different BMW products and come with everything you need to properly change them included right inside the box. 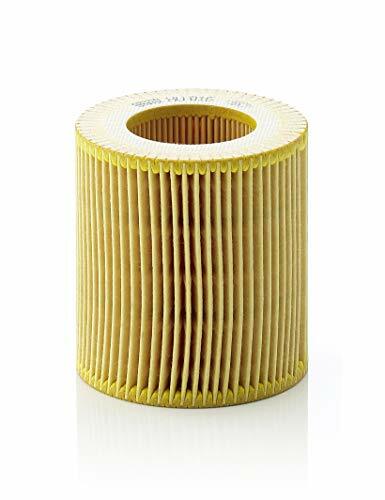 They have a specially designed pleat construction that allows more surface area for filtering and they also feature a very high capacity for storing the impurities that this filter removes from your engine’s oil. For those of you who are environmentally conscious, please take note that this filter is easily recyclable because of the special way it is constructed. This filter is a little bit tougher to install because of the way the vehicles that it fits in are designed. If you bought this for a BMW product you may want to consider having a factory trained mechanic put this in for you. There are literally thousands of different oil filters in the marketplace and that is a lot to choose from for sure. We reviewed some of the best ones we took a close look at but these 10 filters do not come close to fitting all of the different model vehicles there are. Instead of leaving you in the dark, if you can’t find a model oil filter among are reviewed items that suit your needs, then we feel compelled to guide you in the right direction to find an oil filter that does. Your oil filter plays too important a role in your vehicle’s combustion process to leave to chance. It is definitely not an area where you always want to buy the cheapest one or the first one you come across that fits your vehicle. So how do you tell if an oil filter is a good one? Here are some things to pay attention to as you shop that will ensure you get a filter that works very well for you. Before you can even begin to start shopping for an oil filter you must know the part number of your current oil filter or its dimensions. The part number can be found either clearly marked on your old oil filter or should be listed in your owner’s manual. You can also measure the length, width, and diameter of your oil filter if you get in a pinch and can’t find a part number anywhere else. If you are shopping for a new filter in a store you can always take your old one with you just to be sure you get one that fits your vehicle? If you do not go with the same brand filter as your original oil filter you will have to cross reference your current manufacturers’ part number with the part number for the new brand oil filter that you want. This is a standard type oil filter where the engine oil just circulates through the filter media in it. The dirt and other contaminants are left behind in the filter as the oil passes through it. This filter is exactly the same as a mechanical but it has an extra dimension added to it. It features a magnet that will remove any metal particles that become suspended in your engine oil. This is important because metal particles can do the most damage to your engine if they build up to a significant amount in your engine’s oil. This is the most common type of filter media that is used in an oil filter. These tend to be less expensive filters and will typically remove 97% – 98% of the contaminants and small particles that get in your engine oil. 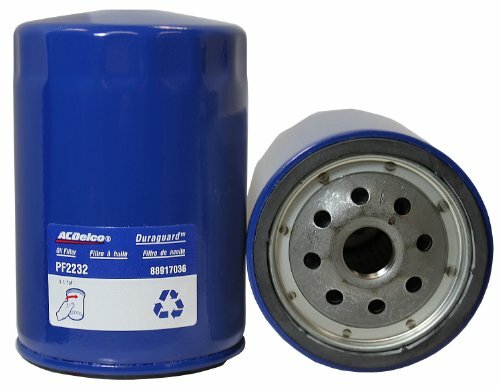 These types of oil filters are becoming more and more popular. They will cost you more money but they will filter out over 99% of the contaminants and small particles that get in your engine oil. Most manufacturers recommend you change your oil filter every 3000 – 5000 miles, but with the right combination of high-grade oil and a superior oil filter, you can extend the mileage between oil changes. Make sure you check the recommended mileage range on the filter you want to buy before trying to do this. 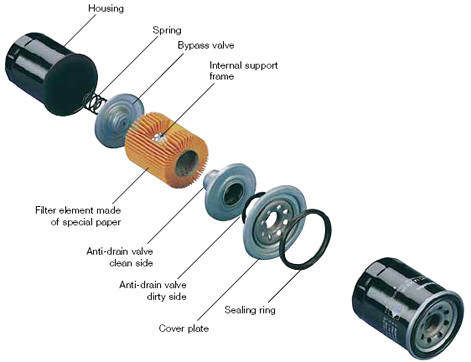 ANATOMY OF AN OIL FILTER – HOW THEY WORK? Most do it yourself mechanics change oil so regularly that it becomes a matter of routine. They buy oil and a new filter and before you know it that oil change has been done. Despite this level of expertise at changing oil, many of them do not know exactly how an oil filter works. That is not good because knowing how an oil filter works will help you greatly when it comes to choosing the right oil filter for your needs. Here is a quick overview of oil filters main components and how they work. There is a plug at the bottom of your oil reservoir that will let you drain your old oil out of your vehicle. Once that is done you can then remove your old oil filter. As you put your new oil filter on there will be some things you will notice about it and some things inside that you can’t see. This is the hard outer covering that shelters the inside media from being exposed to elements and also acts as a containment vessel for the contaminants and particles that are removed from your engine oil as it passes through your oil filter. It is solid in nature (please note diesel vehicles and some imports use oil filters that are placed in permanent canisters in the vehicle and they do not have hard outer shells) to also help you to grip it with your hand or filter wrench so you can snug it up tightly into place so it will not leak. 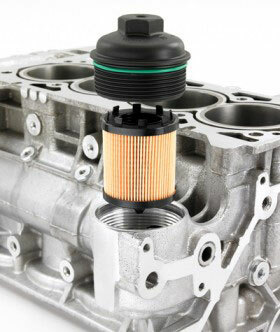 One end of the oil filter will be open as you would expect to allow the engine oil to flow into the filter. Where the filter connects to your vehicle you certainly don’t want it to leak so manufacturers design a special seal to help prevent leakage in this area. Not all oil filters seals are the same either. Most come with a rubber gasket but some have additional properties that keep this gasket lubricated better. Others will also seal even tighter once the hot oil starts flowing into them. This is what helps separate out the contaminants and particles that are sometimes suspended in your engine oil. They are usually made out of either pleated paper or a specially fabricated synthetic material. Filters with paper media are usually around 98% efficient at removing contaminants and particles while synthetic filter media can remove over 99% of these most of the time. Some, but not all, filters have an additional magnet placed inside them. There is nothing more prone to damaging your engine than oil that has metal particles suspended in it as it flows through your engine. By having a magnet inside your oil filter acts as an insurance policy against any of these suspended metal fragments being able to escape your oil filter. These are a critical part of any oil filter. Even if your filter stops doing its job the oil must still be able to flow freely through it at all times or you will blow your engine. Oil filters that are not changed regularly are likely to get clogged and stop working. When this happens pressure builds up inside the oil filter and when it gets high enough the check valve will open and allow the oil to bypass the filter media and keep flowing freely. All of these components come together to make sure your engine oil stays clean and flows freely because once the oil stops flowing your engine will expire in just a very short time. The expense involved in repairing a blown engine can be so extreme it may be cheaper to just replace your vehicle. Oil filters are not usually that expensive to replace so we always recommend that whenever possible. However, there are times that you may need to actually repair a defective oil filter in a pinch if a leaking seal is the problem. Even new oil filters can fail at the seal and need to have this corrected. Here are a few ways to fix a leaky seal on an oil filter. 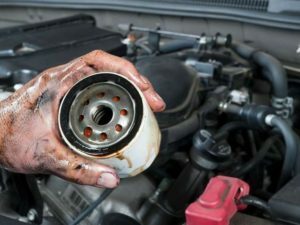 Step: The problem getting your oil filter to seal may not actually be a problem with the rubber washer or the filter itself and may be caused by a buildup of some sort where your oil filter attaches to the engine on your car, SUV or truck. Clean this area up with a cloth and some engine degreaser just to be sure. If that does not work go to step 2. Step: Take out the rubber washer and check for imperfections in it. If the rubber washer is ok, then next make sure it is well lubricated in engine oil. 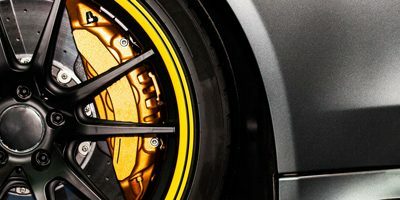 Dip it right in a pan with the bottom covered with fresh oil (don’t dip it in used engine oil because it may allow contaminants to get into the fresh oil you will put in the engine). Try reinstalling the oil filter. If it still works go to step 3. Step: If you put the oil filter in by hand try cranking it on a little tighter with an oil filter wrench. Be careful not to crush the new oil filters outside canister. If this does not do the trick, then it is probably best to go ahead and purchase a new oil filter. You may be able to get credit for the defective oil filter if you saved your receipt. If the oil filter is no longer leaking around the seal then go to step 4. Step: If you were able to seal up the new oil filter where it connects to your engine that is great. You will now have to check the engine oil level and top it off if you lost a significant amount while fixing the leaky seal. Believe it or not many diesel engine vehicles and some cars have what are known as ‘reusable’ oil filters. These are filters that you can do exactly what their name says; you can clean them up good and reinstall them in the vehicle they came out of. Why would anyone want a reusable oil filter in their vehicle? There are several reasons for this. For one, they cost more initially but will save you money in the long run. They are also usually superior quality filters that will eliminate even the smallest of harmful particles from engine oil. If you are a person that is environmentally conscious they also will not contribute to hurting the environment as much as single-use filters will. If you are one of those people that have a reusable filter on their vehicle then this is how you go about cleaning it. Drain the oil out of your vehicle completely. Remove the oil filter from inside the canister that it is placed in. ‘Gently’ wash the oil filter in engine degreaser. This is best done in a parts washer on its lowest setting but can be done almost as well by hand washing it in a basin filled with degreaser. Let the filter dry completely. Reinstall the oil filter and then top off the engine oil on your vehicle. Remember no oil filter change is complete until you have inspected it for leaks with the engine running. Why Should You Change Oil Filter for Your Car? Every car owner knows full well that oil changes are a must because you want to ensure the longevity of your engine. Being sloppy with this procedure will result in a number of bad consequences. The worst of them is to have your engine completely destroyed. Various cars and various oils have different length of life before a change is required. The same goes for filters. In most cases, you are looking at 5000-7000 miles per change. But how can you tell if the oil needs changing? Well, check the cartridge. Even though the stick may indicate that you have plenty of oil, inspect the oil itself carefully. If it seems to “thin” and dirty then you are in trouble. Thin oil will not be able to hold oil pressure anymore. This will lead to the oil pump being unable to spread the oil all throughout the engine in order to lubricate it. And that’s a sure way to have your engine start coming apart. In this case, the mileage of the car is often irrelevant. You might have an engine with only 120 000 miles and will still be destroyed. How Will Oil Filters Help Us? Well for starters, the filter will be able to pick up all the metal particles and dirt flakes from previous oils. It will also capture parts of the build-up inside the engine. Furthermore, in time oil will start to oxidize – this is inevitable. This process leads to the forming of even more particles and the filter helps against them as well. Similar to all good things in life, an oil filter also has its capacity. Beyond it, some particles will start passing through and that’s definitely a no-no. If the oil filter is stuffed, unfiltered oil will pass through and this will lead to damages to the engine. So it is obvious that frequency matters. Almost every expert will advise you to simply change the oil filter whenever your oil change is due. You shouldn’t wait for the service light on your dashboard to come up. Check the specs on your oil and go to the nearest mechanic when it is time for an oil change. Yes, replacing the oil filter will set you back some money but it well worth it as it will revitalize your engine. Sometimes the fact that you still have enough oil and that you’ve only recently changed it does not mean that your filter isn’t asking for a replacement. Another thing which matters is the climate and conditions in which you drive your car. It goes without saying that if it is dusty, sandy and muddy around you, your engine will get polluted quicker. Driving in the city is considered a relatively clean environment although we can conclude that the life of the oil and the oil filter is also significantly shorter there. Knowing how to change an oil filter may turn out to be an important skill although more often than not, a mechanic will do it for you. But what if you are just starting as a mechanic? You might actually find the information below to be useful. Interestingly enough, the preparation for changing the oil filter doesn’t begin with your own attire. It actually concerns the car itself. First of all, you need to have the engine running for a few minutes. Wait for the heat indicator to move. This will mean that the engine has gotten warmer and the oil will, of course, also has its temperature raised. Of course, you don’t want to go overboard with this because hot oil is dangerous to drain. So make sure the engine doesn’t get to its completely operating temperature. The second part of the car preparation is about making it completely stationary. Ensure that you’ve applied the parking brake and maybe put a couple of rocks behind the wheels. Next, you want to dress appropriately putting gloves and safety glasses on. Locate the oil plug and unscrew it. 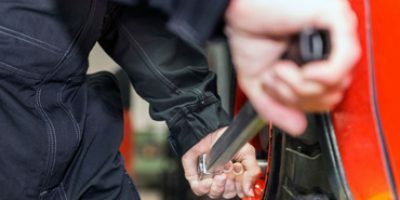 Initially, you will need to loosen it up using a wrench. Then you finish the job by hand. You will need to have a pan ready just under the plug. The oil might be warm so watch out. Definitely, have your gloves on. As you drain the oil, we recommend that you also unscrew the oil cap on top of the engine. This way some air will access the cartridge and will speed up the whole draining process. As the old oil goes away, you got one more part to replace and not just the filter. It’s the oil plug on the bottom. It also has to be fresh. This is the dirty work – the actual oil filter removal. You need to tread lightly because the oil in there will likely be still too warm. Use the oil filter wrench to actually pull the filter out. After that, you want to clean the area as much as you can. Another thing to watch for is the gasket from the old filter to no be stuck on the mounting surface. Before you install the new filter in there you want to lubricate it lightly. Apply some fresh oil to the rubber seals. This will prep the filter for the job it will have to do. Typically you would be able to put in in place using a hand. However, you should refer to the instruction manual of each filter in order to make sure it doesn’t require fastening by a wrench. Pour in the new oil until the capacity is reached. Some people replace the oil cap although this isn’t necessarily required. You want to run the engine and look for any sort of leaks. In the best case scenario, there won’t be any. The engine will need to rest for a minute so that the oil can subside. Check the dipstick and make sure it is at the full mark. Wipe it and check again. Don’t forget to dispose of the old oil filter properly. 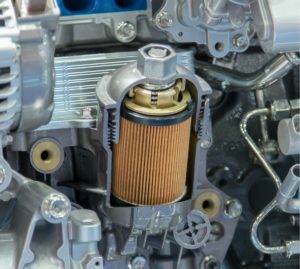 What’s the purpose of oil filters? The short answer is that they don’t let particles pass through together with the oil. Filters keep the oil fresh and clean thus protecting the engine. In most cases, we are talking about metal debris, dirt fragments and any sort of grime that may occur inside the engine. The oil will inevitably collect some particles on the way back to the sump. As it makes its way back to the engine, the oil passes through the filter. Why do we need all that? The oil will eventually get thinner and lose its viscosity. This happens mainly because of the debris. The filter will ensure a longer life for your oil. Furthermore, those fragments may damage the engine. Can’t the filter last forever? Since all good things come to an end, the story with the oil filter is pretty much the same. Every filter regardless of the liquid that it handles will eventually become clogged and worn out. Its integrity will be compromised and will not perform to its capabilities. Most car systems allow for the oil to go through the bypass valve and still end up in the engine. But we don’t what that because the oil is then unfiltered. In most cases, whenever you change the oil of the engine that’s when you also replace the filter. However, it is best if you refer to the instructions of each filter separately. Furthermore, driving in certain conditions may lead to a quicker clogging of the filter even before an oil change is needed. There is no doubt about it, having clean oil running through your engine is paramount to long engine life. That is accomplished through performing scheduled oil changes and by having the right oil filter on your vehicle. We have reviewed ten great oil filters in this oil filter reviews and if they fit your vehicle you should not hesitate to buy one of them. Hey, will all do a nice job keeping your oil free from contaminants? If these filters don’t work for you, then be aware of what we highlighted in the buying guide. If you do these things then you are sure to find the best oil filter for your car, SUV or truck.